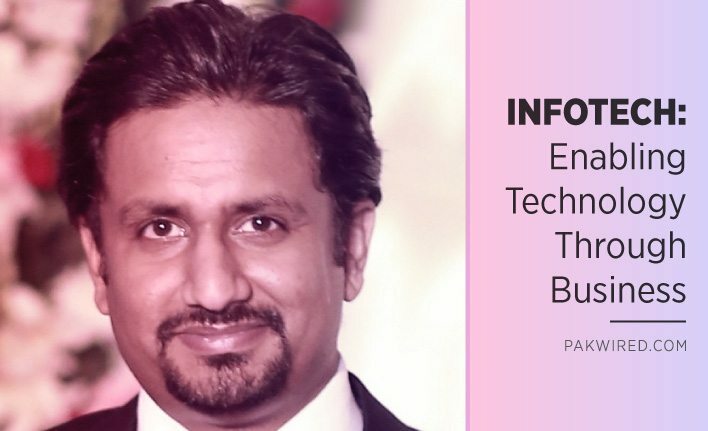 Infotech’s Director Muhammad Haris Naseer talks about the company’s rise to success and what entails progressive techpreneurship in Pakistan. PakWired (PW): Tell us about the company, what are its core businesses? MHN: We started our business focusing on selling technology solutions back in 1995. Technology was going through an exciting stage in Pakistan as companies were just beginning to understand the promise IT held for them and were starting to automate. We invested in our capabilities and quickly started delivering complex solutions. Partnerships with IBM and Oracle, which we concluded early on, helped us in defining our strategy, and by 2004 we had wrapped up important alliances that allowed us to offer a complete portfolio of IT solutions to our customers. By 2000, we had expanded across Pakistan but opened up our Middle East head office in 2005, our global head office in Singapore in 2007 and our African HQ in 2009. By 2010, we were competing across a hundred countries, winning and delivering projects in eight countries around the world. We have over 300 resources now, excelling as we learn and working on continuous improvement. PW: Tell us a little bit about Infotech’s journey? MHN: Our current CEO Naseer Akhtar founded the company back in 1995. It has been quite a journey for us from being hardware resellers of big brands like IBM and Compaq etc. to software resellers, subsequently consultants to tech vendors and eventually graduating into a system integration company. In 2005, we started developing our own products primarily focusing the capital market sector and offering a full suite of software solutions for stock exchange and stockbrokers. We are only exporting this particular set of offerings to emerging markets of Africa and parts of South Asia. Our products are currently being used all over the English speaking African countries like Tanzania, Rwanda etc. On the Asian front, we are doing business in Bangladesh and Bhutan; in addition to our operations in the Middle East. PW: Comment on Pakistan’s entrepreneurial landscape. MHN: Looking things in retrospect, there was a lot of room back when Infotech started, if you compare it with the current scenario. As far as the present entrepreneurial landscape is concerned, this space (system integration) is now pretty well occupied. So it would be difficult for someone to kick start a venture now in this sector than establishing one maybe 15 years ago. There are six to seven big companies who have captured the market. It would definitely be challenging for newcomers. But on the other hand, there are tremendous opportunities in new areas, especially very Internet-centric ones such as ecommerce. This is a very large space that has immense potential. There have been quite a few ventures that have been raising capital to take their companies forward. If you are a company with a team of 10 to 12 people and a capital of half a million dollars, you can really gain foothold in this sector. PW: There is a general negative opinion in some sections of Pakistani society about making transactions online, will such issues cause real obstacles to growth, technologically speaking? MHN: Yes there is an absence of online transaction system in Pakistan. Indeed a number of users are wary of making a financial transaction virtually. But that is just one aspect of the situation. How much of this is actually affecting the ecommerce business? If you take an example from India, 70 percent of Flipkart’s business is based on cash on delivery. So not having an online payment system is not really an obstacle. There can be diverse solutions other than the financial transaction one. Another thing is, the whole online user experience can never really match the physical feel of going to the shop and trying products yourself. So I am not compelled for instance to buy my shoes online. Yes if I find products that are not readily available in the local market, I would love to buy them online. The virtual business really needs to focus on this challenge. Successful techpreneurship entails three kinds of skill sets. First and foremost, the product or technology that you are developing has to be top notch. Second is attaining the right businessperson on your team. You can build a Rolls Royce but if you don’t know how to sell it, you wont make money. PW: When the world is moving towards digitization and people are living in parallel realities, how do we compel consumers to explore the virtual world and buy online, which is now a rage globally? MHN: I would approach it in two ways. The main question is what value are you offering to your consumers? The answer is that you are selling something, which your consumer doesn’t have access to. This will compel them to buy your products. Then you add some value to the product financially. If you look at the global market, products are comparatively cheaper online. Mainly because they have lesser overhead costs and are able to offer better prices. So at the end of the day, all a consumer wants is, yes, a good product but at a better price! They will opt for companies, brands or products that save their money. So if I were getting a branded kurta for Rs 3000 online and off, why would I be compelled to buy it online when I can go to the shop and am able to pick and choose. These are some of the points both the retailers as well as tech companies need to discuss. PW: How can we make our local retailers tech savvier so that they can join the ecommerce bandwagon for progress and fueling the economic activity of the country? MHN: If we compare our local retail industry with – let’s say – the West, they were at similar crossroads eight to ten years ago. It is all about educating the product owner about the immense potential of technology and the digital world. It will take time. But technologists and companies need to take a different approach. Instead of selling their technology, they need to sit down with these retailers and explain to them the scalability of online business. How their technology will enable the vendor /retailer reach a wider audience apart from their targeted ones. Make them understand the national, regional and global reach of their brand by doing business digitally. It is really upon technologists to come up with a business case for retailers due to the latter’s lack of awareness. They do have their own challenges and by empowering them, we are empowering both industries in the long term. I think ecommerce development has been led by the tech sector for people to jump on. It won’t happen anytime soon and will take a few years to catch on. PW: How can we empower our local talent pool of techpreneurs? MHN: Techpreneurship in Pakistan is still at its infancy stage. At the same time, there is a lot happening, especially in the tech sector, which is definitely an encouraging sign. Young grads want to do something on their own. Now how well they are being trained to do that is another topic. But yes that energy and drive is there. The lessons learnt by first generation entrepreneurs like Infotech’s Naseer Akhtar should be transferred to the new generation of self-starters. Of course they will also learn by the journey taken. Established entrepreneurs can create an enabling environment for their younger counterparts. A number of these young techpreneurs are working on great technologies, but they need training to better equip themselves on the business front in order to raise money. But I think it is part of the infancy, learning stage that we are going through at the moment. PW: What does scalable techpreneurship entails? MHN: Successful techpreneurship entails three kinds of skill sets. First and foremost, the product or technology that you are developing has to be top notch. Second is attaining the right businessperson on your team. You can build a Rolls Royce but if you don’t know how to sell it, you wont make money. What I have seen in young techpreneurs is that they seem to be hesitant to include the older generation of businessmen or experienced people. That experience needs to be brought in to make it a winning mix of business and diversity. They look at Facebook and see Mark Zuckerberg, a young gun, failing to realize that although he launched a phenomenal company, successful entrepreneurs like him have teams of highly experienced business personnel. So scalable techpreneurship requires flexibility in approach to ensure diversity.